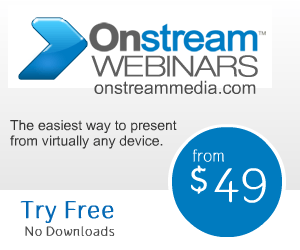 Today, Onstream Media webinars have made continuing education even easier for the busy professionals who are working to move their careers forward, whether in the same field or a new one. In fact, according to the US Department of Education’s National Center for Education Statistics, the demand for continuing education among professionals aged 35 and over is predicted to rise by as much as seven percent by 2016. This highlights the growing importance of reaching more professionals in a way that is most convenient for them. One of the most important reasons you may need continuing professional education is for the benefit of your own career. Your employer may require you to obtain more skills to complete your job more effectively or to earn a promotion to another position. For instance, your company may upgrade some of the equipment you must use or start using a different software system. In these situations, using webinars for your continuing education can be a great way to get up to speed on the new equipment or software. Depending on your field, continuing education may also be important to maintain your license or qualify for raises. If your job requires these courses, they may even offer financial assistance or incentives to complete the work. Some people are looking for an easy way to transition from their current career to a new one. You may already possess some of the skills the new career requires, but continuing professional education may be necessary to build on those skills and add the new ones you require to succeed in the new career path. In some cases, you may need a new degree. No matter how much education you require to switch careers, using webinars and online schooling can be one of the most effective ways to gain the knowledge you need while you continue to work. Learning something new for the sake of learning or to start a new hobby to do in your free time for enjoyment. Completing specialized education opportunities that open up new doors, including higher wages, progression into management or administration or improving your chances of getting promoted. Improving your marketability, making you a stronger candidate for certain jobs than other applicants. With all these benefits, you can see why it is so essential to continue learning, even after you have earned a degree. Just because you have completed college doesn’t mean you don’t need to learn anything further. While many people shy away from continuing professional education because they simply don’t have the time, this should no longer be an excuse. With the increasing use of webinars and other Onstream Media communication tools, even the busiest professional can find the time to improve their career with continuing education courses.